The Authority’s wastewater plan divides the Township into five drainage districts, designated Areas A, B, C, D, & E. Areas A, B, & C are located in the southern and eastern portions of the Township where natural flow or drainage is easterly in the direction of the Pennypack Creek. Areas D & E comprise the central and western portions of the Township, respectively, and drain northerly in the direction of the Neshaminy Creek. Pursuant to an agreement dated July 16, 1959 and subsequently amended between HWSA and the Upper Moreland Hatboro Joint Sewer Authority (UMHJSA), sewage collected from Areas A, B, & C is treated in a sewage treatment plant owned by UMHJSA. Under the Capacity Agreement, the Authority owns 2.15 MGD (average daily)/2.7156 MGD (hydraulic design capacity), or the equivalent of 29.97% of the UMHJSA plant capacity. The Authority’s share of the cost of operation of the UMHJSA plant is in proportion to the amount of sewage attributable to the Authority. HWSA is also responsible for 29.907% of all capital upgrades and additions to the UMHJSA plant. Area A located in the northeastern corner of the Township is served by a 16” diameter interceptor with a peak capacity of 3.74 MGD and an average daily capacity of 1.5 MGD. Area B is located south of Area A and includes the mid to lower eastern portion of the Township. Area B is served by a 20” diameter interceptor with a peak capacity of 6.82 MGD and an average daily capacity of 2.73 MGD. Area C is located in the southeastern corner of the Township and is served by a 10” diameter interceptor with a peak capacity of .8 MGD and an average daily capacity of .32 MGD. The County Line Road Pump Station (CLRPS) and the Easton Road Pump Station (ERPS) are both located in drainage Area A. The CLRPS is located on County Line Road at Willow Drive, approximately 1000’ east of Route 611. Flows from CLRPS are conveyed to the UMHJSA plant for treatment. The CLRPS is equipped with two constant speed pumps each rated with a capacity of 180 gpm, or 259,200 gpd. The 2017 average daily flow of approximately 32,217 gpd was significantly below the capacity of the pump station. The peak instantaneous flow is projected at 128,868 gpd (89 gpm) based on average flow and a 4.0 peaking factor. The peak flow is less than the 180 gpm pumping capacity of each pump. The ERPS serves a light industrial area of the Township within drainage Area A. The ERPS is located on Route 611 within an easement to the rear of several industrial properties within the 1100-1200 block (roughly across from the Aviation Museum on the former NASJRB). The pump station serves seven commercial properties and has a permitted capacity of 0.027 MGD. ERPS is a duplex submersible type equipped with two constant speed pumps each rated with a capacity of 224 gpm, or 322,560 gpd. In 2017, the average daily flow to ERPS was 5,211 gpd. The peak instantaneous flow is projected at 20,844 (14 gpm) based on average flow and a 4.0 peaking factor. The projected peak flow is less than the 224 gpm pumping capacity of each pump. There are no pumping stations in drainage Areas B & C.
In 2018, the average daily flow from Horsham to the UMHJSA plant was 2.6 MGD. In early 2019 the Authority anticipates start of construction for a project that will transfer approximately 200,000 gpd of current and projected future flow from Area A to Area D, with subsequent treatment at HWSA’s Park Creek Sewage Treatment Plant. Included in this project is construction of a new pump station and decommissioning of the CLRPS and ultimately the ERPS. All public wastewater from Areas D & E is conveyed to the Authority owned Park Creek Sewage Treatment Plant (PCSTP), with the exception of the English Village Apartments which are served by the privately owned English Village Treatment Plant. In 1986, the Authority purchased the Wichard Sewage Treatment Plant to provide wastewater treatment in Area D. The Wichard Plant had been built privately and was originally designed to service the Wynmere development. Construction of the PCSTP was initiated in 1987 in order to provide wastewater treatment to accommodate the construction of the Commonwealth Corporate Center by developer, Hansen Properties. By agreement with Hansen, the former HSA participated proportionally in the cost of the construction of the plant. In 1991, construction of the original PCSTP was completed. At that time, PCSTP had a total permitted capacity of 0.5 MGD, of which 0.283 MGDwas allocated to Harnsen and the remainer to HSA. The completion of the Park Creek Plant and the construction of interceptor sewer lines allowed the Authrotiy to divert wastewater flow from the Wichart Plant to the PCSTP. The Wichard Plant as well as the former Danridge pump station which served a portion of teh Wynmere Downs development, were subsequently demolished. Between 1997 and 1999, PCSTP was expanded to increase the permitted capacity to 1.0 MGD. In 2004, upgrades to PCSTP included reconstruction of the raw sewage pump station from a wet well/dry well to a submersible pump station, replacement of the screen chamber with a comminutor, addition of stairs to replace the offset ladder, replacement of slide gates in the flow channels, and addition of a valve chamber. These improvements increased operation efficiency and improved safety. In 2005, the U.S. Congress approved the Base Relocation and Closure Act which provided for the closure of the Willow Grove Naval Air Station/Joint Reserve Base (NASJRB). In 2006, the English Village Apartments pre-purchased wastewater treatment capacity in the PCSTP in order to accommodate the ultimate connection of the apartments to the HWSA system. These factors, as well as multiple then-proposed development projects and Authority sewer extensions, led HWSA to authorize the preparation of an amendment to Horsham Township’s Act 537 Plan to provide for the expansion of the PCSTP. Accordingly, an Act 537 Plan Special Study providing for the expansion of the plant to address the existing and future sewage disposal needs for Areas D & E including redevelopment of NASJRB was submitted to the PA Department of Environmental Protection for review on January 30, 2007. In the meantime, during 2006, former Governor Rendell was working with the U.S. Congress to remove NASJRB from BRAC 2005 and create a military to military transfer. The U.S. Congress enacted special legislation whereby ownership of NASJRB was to be transferred from the Navy to the Air Force. In turn, the Air Force was to lease approximately 80% of the property to the State of Pennsylvania to be utilized for homeland security, national defense, and emergency preparedness. The Air Force agreed to assist Pennsylvania with its vision for a Joint Interagency Installation (JII). The PA Department of Military and Veterans Affairs retained the services of L. Robert Kimball & Associates to prepare an implementation plan in connection with the transition of NASJRB to a JII. The Kimball Report entitled “Preparation of Implementation Plan and Associated Reports in Connection with the Transition of NASJRB Willow Grove to a Joint Interagency Installation under Commonwealth of Pennsylvania Lease or License Arrangement” was issued in February 2008 and included an assessment of existing NASJRB facilities including an existing wastewater treatment plant. The report indicated that the existing wastewater treatment plant at NASJRB could continue to provide sewage treatment for the proposed JII use. On the basis of the Kimball Report, the Authority was caused to re-evaluate the PCSTP treatment plant expansion and thus, withdrew the 2007 Act 537 Special Study submission. In November 2009, a revised Act 537 Plan Special Study was submitted to the reviewing agencies. This plan provided for an upgrade to PCSTP to meet then anticipated more stringent nutrient criteria and to expand the plant to a total of 2.0 MGD in order to accommodate the future ultimate build-out of Areas D & E, including service to the English Village Apartments, as well as a diversion of approximately 500,000 gallons of wastewater originating in Service Area B to the PCSTP plant. The transfer of Area B flows out of the UMHJSA treatment plant was intended to free up the Authority’s share of the capacity in the UMHJSA plant and provide for future growth in service Areas A, B & C without the need to purchase additional capacity from UMHJSA. In accordance with the Kimball Report, however, the 2009 Special Study did not contemplate any service to the proposed JII. That same month, Governor Rendell withdrew his plan for a proposed Joint Interagency Installation at Willow Grove. Following the Governor’s withdrawal of the JII plan, and the official determination that the NASJRB property would go back to being redeveloped in accordance with BRAC law, in June 2010 another Act 537 Special Study was submitted to PA DEP. The 2010 Special Study provided for the expansion of the Park Creek STP from 1.0 MGD to 2.25 MGD based on known developments, zoning projections, redevelopment scenarios for NASJRB, phase out of EVA plant, and a revised scenario for the transfer of flows from Area A, rather than Area B. Modification of existing Septage Tank Building to an EQ Pumping Station, which included installation of 3 EQ pumps with all related controls & electric, relocation of controls & electric for 3 existing Raw Pump & 2 existing comminutors. Addition of a 450 KW generator for south end of plant. Dumping Station for Vactor/jetter truck. Raw sewage conveyance lines (gravity lines to accommodate future growth), force mains & electric modifications to accommodate future plant upgrade/expansion. On August 11, 2011, the 2010 Act 537 Plan Special Study was approved by DEP and in 2015 a $17 million expansion of the PCSTP was completed. Average daily flow at the PCSTP for 2018 was 1.039 MGD. The former Squire Estates pump station (SEPA) was located on Gentry Drive and was constructed to serve the Squire Estates development. Under an Agreement with the owners of the English Village Sewage Treatment Plant (EVSTP), wastewater from the pump station was pumped from SEPA to the privately owned EVSTP for treatment. The former Walden Woods pump station (WWPS) was constructed by a developer and dedicated to the Authority in 2001. This pump station served 32 homes in the Walden Woods and Estates of Horsham Lea subdivision off of Welsh Road. Bypass sewers were constructed in 2003 to transfer flows from the SEPA out of the English Village Treatment Plant to the Park Creek Plant and to eliminate both the Squire Estates and Walden Woods pump stations. The English Village Pump Station (EVPS) is currently the only remaining pump station in Area D. This pump station was constructed in conjunction with the redevelopment of the Shoppes at English Village and was dedicated to the Authority in 2006. The EVPS is equipped with two constant speed pumps each rated with a capacity of 36 gpm and had an average daily flow of 13,267 gpd in 2017. The peak instantaneous flow is projected at 53,068 gpd (37 gpm) based on average flow and a 4.0 peaking factor. The projected peak is very slightly (less than 1 gpm) above the 36 gpm of one pump. Construction is anticipated to begin in 2019 on a project to connect the English Village Apartments to the HWSA system and permanently abandon the private EVSTP. Once this project is complete, sewers tributary to the EVPS will flow by gravity to the HWSA system and the EVPS will be decommissioned. Currently, the collection and conveyance system for Area D includes approximately 51.5 miles of collectors and interceptors and the EVPS. The Chestnut Creek pump station (CCPS) was a submersible type station previously located in service Area E off of Limekiln Pike across from Kohler Farms. This pump station was constructed to serve portions of the Chestnut Creek development and was dedicated to the Authority in January 2001. The Fairway Estates pump station was constructed by the developer of the Fairway Estates subdivision to serve the 35 homes in the development but also included capacity in the design to support connection of other existing homes in the Chestnut Lane area. The Authority never accepted dedication of this pump station as the design of a single pump station to serve Area E was underway. This pump station was bypassed in conjunction with the construction of the Estates at Chestnut Lane and was ultimately demolished. 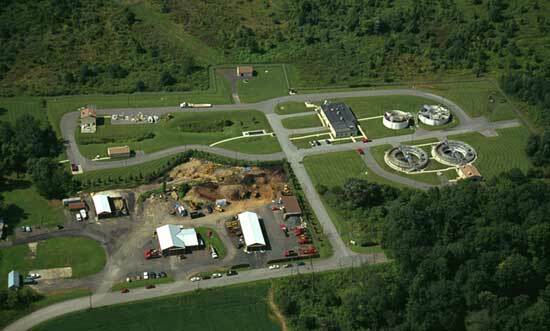 The Little Neshaminy Creek Pump Station (LNCPS) was constructed by the Authority and placed in service in 2005 for purposes of conveying all flow from Area E to gravity sewers within Area D for treatment at the Park Creek Sewage Treatment Plant. This pump station is located at County Line Road and Chestnut Lane. The station is equipped with two constant speed pumps, each rated with a capacity of 238 gpm. The average daily flow to the LNCPS in 2017 was 80,866 gpd. The peak instantaneous flow is projected at 323,464 gpd (225 gpm) based on average flow and a 4.0 peaking factor. The LNCPS is also equipped with emergency generator. In 2008, a 4000’ gravity bypass sewer between Limekiln Pike and County Line Road was completed, conveying flows from the former CCPS to the LNCPS. The CCPS was demolished shortly thereafter. The collection and conveyance system for Area E currently consists of approximately 6 miles of collector sewers and one pump station.